It’s the most anticipated release of the weekend! The latest episode of Sailor Moon Crystal is now available in English on Hulu and Neon Alley. 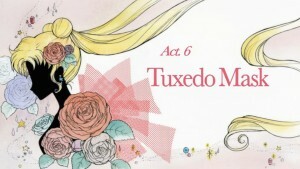 Act 6, Tuxedo Mask, shows us shirtless Mamoru! We also get a look at Sailor V, who we see so little of in the original Sailor Moon anime. 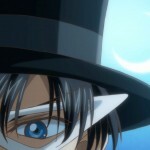 Next Friday is Act 7, Mamoru Chiba – Tuxedo Mask. Original title, isn’t it? 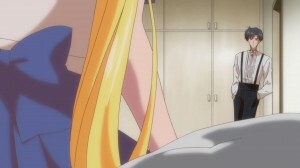 Usagi slept over at Mamoru’s so now everything is on the table. This entry was posted in Pretty Guardian Sailor Moon Crystal (2014) and tagged Hulu, Sailor Moon Crystal Act 6 - Tuxedo Mask, Sailor Moon Crystal English Dub, Sailor Moon Crystal Phase 1 - Dark Kingdom, Sailor V, Tuxedo Mask by Adam. Bookmark the permalink. Once again, I love how the dub works with SMC, especially with the improved animation. They just seem to flow together so well, you find most objections you had to the anime when it first came out almost fading away (though Mamoru’s constant kissing of Usagi when she’s not conscious will always be a problem). It’s just a very good adaptation, and I’m really glad that it’ll be continuing with new episodes (probably with already-better animation). And speaking of problems, one thing that caught my eye: during the episode Usagi seems surprised that Tuxedo Mask knows she’s Sailor Moon despite the fact that he appeared at her window and led her to Makoto in the last episode. 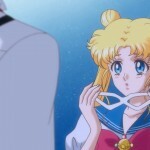 But then if you think about it, Usagi doesn’t know for sure that Tuxedo Mask has seen her transform into Sailor Moon. By the ball episode of course he’s picked up her handkerchief and probably seen her transformation, putting two and two togethr, but Usagi doesn’t even realize that her handkerchief is missing until Act 7, and this girl has only been recognized by other Sailor Guardians (her own parents didn’t recognize her when they saw her in the paper or at the ball). 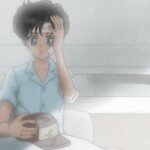 Perhaps she thought that since, in her mind, Tuxedo Mask hadn’t made a connection between the girl at the ball and Sailor Moon, he had instead tracked the girl from the ball down out of a romantic interest and then helped her so she could help save her friend who was being attacked by a Youma. Or Usagi, who will freely admit that she’s not exactly the brainy type, just never considered that her secret might be found out, especially when her parents don’t even recognize her in disguise or as Sailor Moon. Either way, I’m doing mental backflips trying to make this work out in my head. Anyone want to help me make sense of this? I see that problem as more a result of alternate timeline-style time travel, where time travel causes alternate timelines to branch off and cause changes (hence the lack of Eternal or Super outfits). I also think Usagi thought Tuxedo Mask visiting her was a dream and she seemed to be half way awake and not quite sure what was going on. It could also be that in the future they have powered up beyond Eternal (unlikely since they were unable to defeat the BM Clan.) and the forms they have at that level are similar to the original fukus. Or there could be several levels beyond Star Power that they skipped in S/Infinity in order to deal with the threats that showed up and they are at one of those levels. Maybe a timeline with out the Grail kept them from ever becoming Super/Eternal? I guess we’ll never know fr sure, but I think most likely we’ll just have to speculate forever. Is this a more anticipated release than the premiere of Glitter Force on Netflix?